�We are looking for a Doctor who is interested in Pharmaceutical field. �Zifam Pty Ltd has been established into Myanmar market since 1997. Introducing over 100 different line of products Manufactured by Therapeutic Goods Administration (TGA) and WHO GMP certified Factory in Sydney, Australia and India to fulfill Myanmar market needs, �Zifam Myanmar becomes one of the leading, fast growing and a professionally managed pharmaceutical marketing company in Myanmar. • Coordination in developing market survey and marketing plans. •Study and Research the prescribers and products for Core Marketing Processes. • Responsible for new product launching in different areas. • Planning and Design promotional material / tools to support the sales / marketing objectives with cost effectiveness. •Implementing the Scientific and Academic programs. • Joint field work with the field staff to develop the territories and to understand the market dynamics and demand, identifying market opportunities for brand building. • Handling Doctor Interaction and Conducting Product presentation in the CME. • Monitor campaigns for sales promotion. • Train, motivate and guide the field force to ensure the continuous growth of the brand. • Sending regular motivational circulars to the field staff & business partners. • Office based but with fairly frequent travel to attend meetings, prescriber visits, and conferences etc. within Myanmar and internationally. 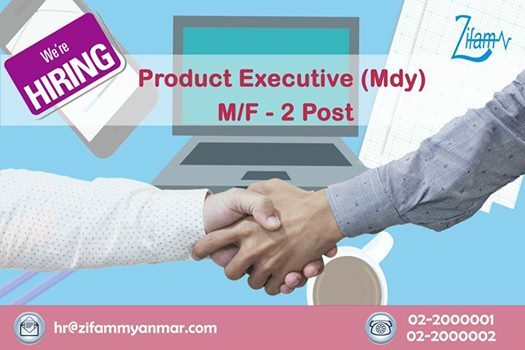 Block-1, Unit 1 & 2, Water Street, Mingalar Mandalay Compound, Chan Mya Tharsi Tsp, Mandalay.